After a day or so of hanging out in Avila Beach, we realized that we needed a few more supplies, so yesterday morning I headed off to Trader Joe’s in SLO. And, knowing that the lovely bride wanted to hang out by the beach, and that I would get a little restless merely hanging out, she suggested that I hit some antique stores after picking up what was needed. So, I headed to TJ’s, and shortly thereafter hit a couple of antique stores. At the third antique store I went to, one of the owners explained that I should head to Arroyo Grande, as there is a mall down there where one of the dealers did have corkscrews. Given it wasn’t that far away, I headed down, and after meandering the shop, did see that were indeed corkscrews for sale. And, the dealer’s prices were pretty spot on. And, they had 3 different H & B MFG. 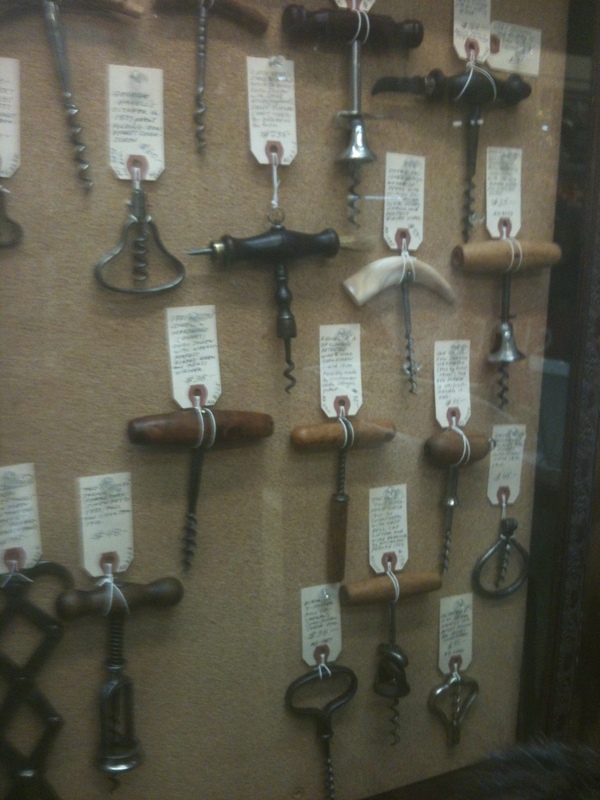 corkscrews, some with blades, but the prices were just high enough that I opted to not buy them. Interestingly, a dealer two booths away also had a marked H & B corkscrew for 1/5 the price that the dealer with the the display. I did buy that one. After meandering a bit more, I headed to the register and paid for the H & B, and after a bit of discussion got a lead on someone that might also have corkscrews. I left my business card, and wondered if indeed they would contact me. I started driving back to Avila Beach, when my phone rang. 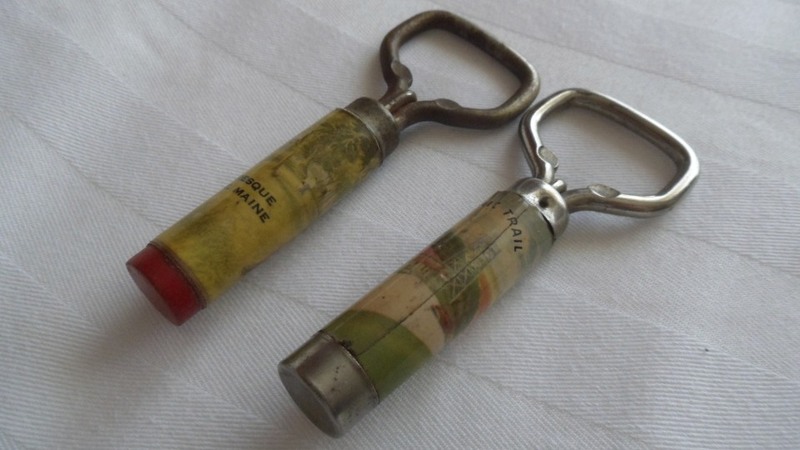 The aforementioned lead was calling me, and telling me they just got back from an antiquing trip, and had some corkscrews that they recently found. We discussed what they were, and I was invited to their house to see what they had available. And, so I soon found myself, pulling up to their house, and being waved into their garage where they had 50 or so corkscrews on a work bench. Out of the 50, two were definitely going to be going home with me–well, depending on the asking price. After a bit of corkscrewy conversation, I decided to make an offer. And, while I wanted to be fair, I was hoping for a good deal. I threw out a price, and with little hesitation, the deal was done. So, what are the two corkscrews, you ask? 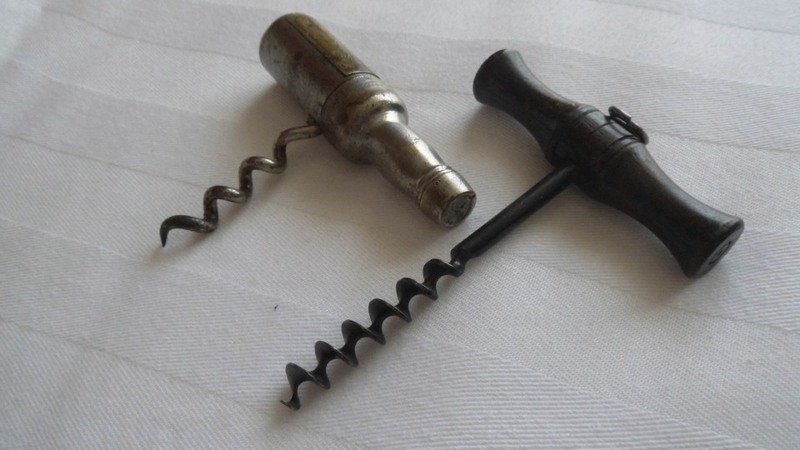 The first is a Williamson corkscrew, but the unusual cellarman patented piece that is shown in O’Leary’s 2009 update, and one that I have never had before. It is marked, WILLIAMSON CO. NEWARK, N.J. The second is a bit more exciting, as it has been on my want list for some time. Definitely a nice addition to the collection; Thomas M. Strait’s American Patent Number 279,203 of June 12, 1883 and marked PAT.JUNE.12.83 on the barrel! The lovely bride and I hopped on the boat the other day, and headed for Boston, where we boarded a plane, and flew to Los Angeles, where upon be hopped in a car, and headed up the coast to Avila Beach. Today we will be wine tasting in the SLO area, and tomorrow possibly a bit more tasting in the Paso Robles area. On Saturday, the lovely niece is getting married in Paso, and following the nuptials, we will head back to L.A., back to Boston, back to the boat, and back to the island. If we happen to find any corkscrews along the way, I will provide updates! I love trading corkscrews. And, over the years have made many trades many different collectors. 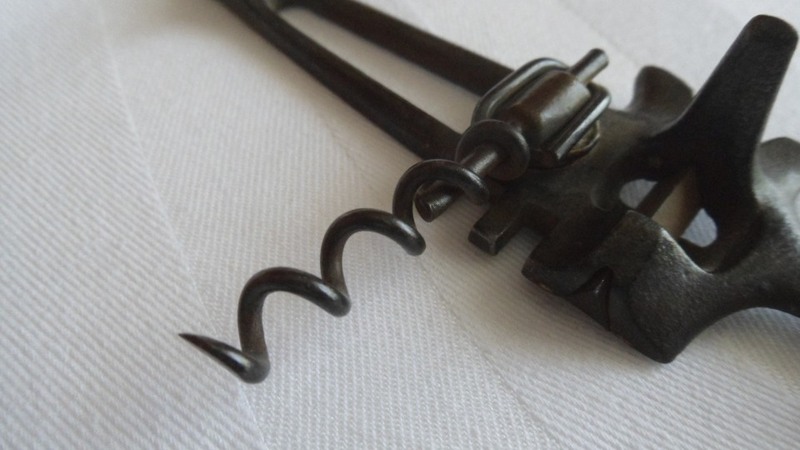 And, there have been a couple of times, where after the trade has been made, I kind of regretted giving up the corkscrew(s) that the two parties had agreed upon — I still honor the trade of course, I just hate to see them go. I once traded a Thiery and Crosselmire silver overlay piece to Tommy during one of our marathon trade negotiations…and, had the opportunity to buy it back, as he happened to toss it on eBay a while later. And, I once traded the Gundlach example of the Frary to Robert, before I was trying to collect every Frary on the planet. And, in an apparent moment of weakness, Robert agreed to trade that piece back after he had found another Gundlach. I will have to say, that for the most part, I am fine with the deals that have been made. And, even with the T & C and the Gundlach, the deal was very fair, and I did net out nice corkscrews that I wanted, but still…for some reason I wanted to get those two pieces back. I have lost track of how many trades have been made. Some are monumental where many corkscrews change hands, some are straight up deals one for one, and some, like a recent one with Don Bull, included a player to be named later. To me, the trade, and the art of deal is one of the best parts of collecting. 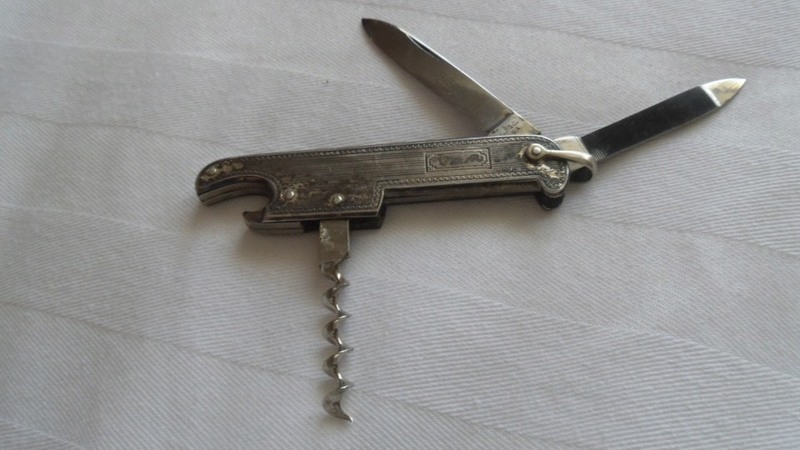 I found this corkscrew at a flea market for 15 bucks, you found your corkscrew at an antique show for 20, and we both know that the corkscrews have a significant, but similar, value. Let’s swap! Still, a recent trade with RL, involved a cork puller that I had sent to him in trade several years ago. And, ever since, when we enter into trade negotiations, I have asked if that will be part of the deal. A few weeks ago, RL put the Sterling Converse on the trading block, and I didn’t hesitate. It arrived on Friday, and now it is back in the collection, and here it will remain. Let the trade offers pour in! Over coffee yesterday morning, I checked email only to find an inquiry about a corkscrew, and attached to said email of inquiry was three pictures. I looked at the pictures a couple of times, and thought it looked vaguely familiar. 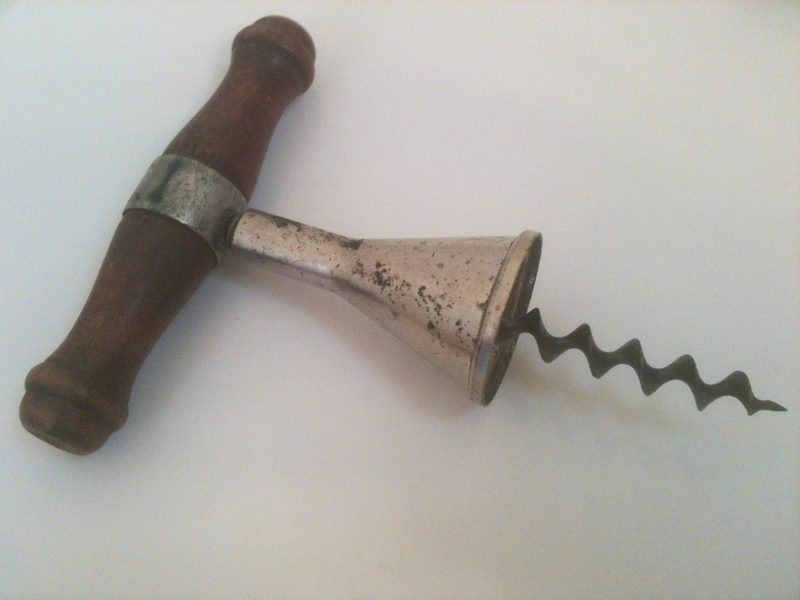 I responded with, yes, it is a cork puller and wondered if it was something that they were interested in parting with. Hmmm… I wonder if I could manage to fit another corkscrew into the case. I am pretty sure it will fit! I did check the corkscrew case, to be sure however. It is getting a little crowded in there, but I am pretty sure there is still room for it. And, so an offer was made, a price agreed upon, and paypal funds transferred, and said cork puller was mailed out yesterday, and according to the tracking information soon will arrive on Vinalhaven. After thumbing around through the various books (check O’Leary page 124) it was confirmed, this is an 1907 James B. 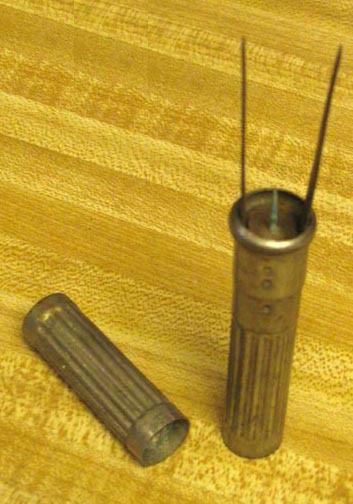 Dodge patent Cork Extractor. Sure… that makes perfect sense. That said, if any of you have an old tool box filled with tools in your garage (or attic, or basement, or shed, or …) and one of them looks like it might facilitate the withdrawal of a cork, feel free to drop me a line! I am sure I have room! In 1886 E.A. Thiery and C.F. 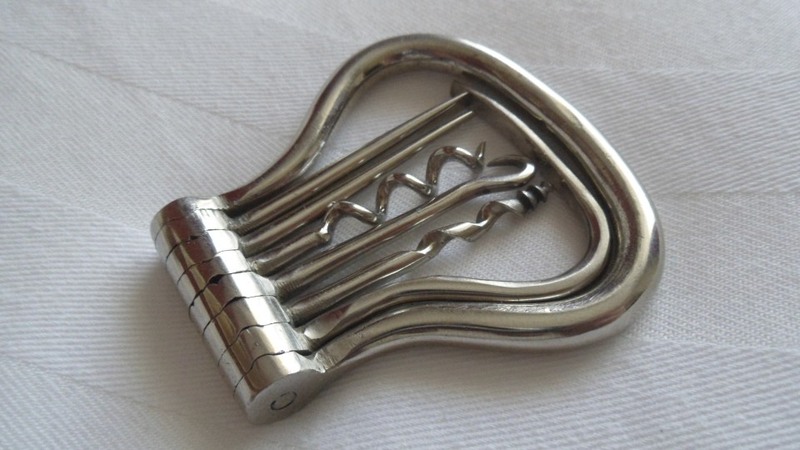 Croselmire were awarded patent number 333,697 for “article of jewelry and method of ornamenting the same.” And, while their patent isn’t specifically for a corkscrew, there are examples of their patented process that turn up on corkscrews every once in a while. 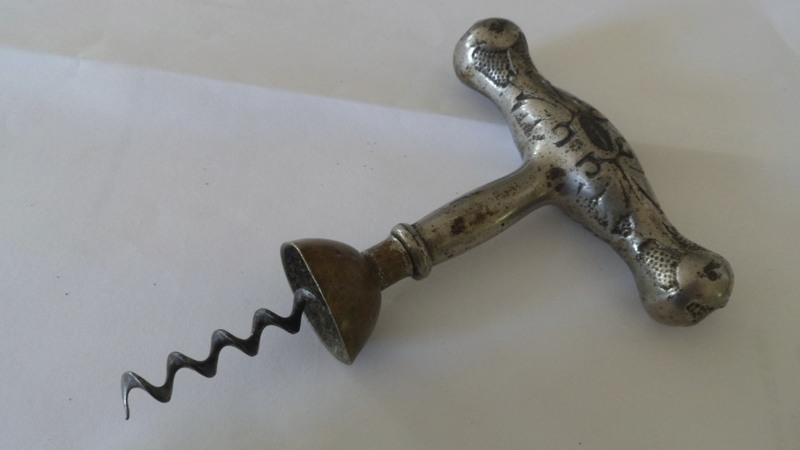 As mentioned earlier, I happened upon a stag handled corkscrew at Brimfield this past week which looks to have a silver overlay Thiery and Croselmire patent end cap. And, for comparison, I figured I would include images of a T and C with no material removed from the silver overlay, a handle with several sections of silver removed to show the stag handle, and finally the stag handle with end cap and a close up of the end cap itself. Looks like T and C to me, what do you all think. The way it works is like this. All the dealers have their trucks, vans, or cars parked out in May’s field, and while they can have tables set up, they are not allowed to set out any merchandise for sale until 9:00 am. Being unable to set stuff up, the idea is that the dealers can’t buy from each other, and no one is allowed in early. So, while they are awaiting the clock to strike 9, the crowds stand impatiently at the gate, also waiting for nine o’clock where upon they pass through the gates and start making their way along the aisles where little has yet to have been placed on the tables for sale. And, so you do. You come back, only to find that they didn’t have any corkscrews, or it is one of those grapevine things, or worse…they just sold it to someone else. Still, there are advantages as well. In May, I picked up a Murphy flynut corkscrew that had just been placed on the table, even though several other collectors had been by. Stuff suddenly appears, so it requires multiple laps around the field. That said, this show (minus the first day) hasn’t really been a good one for corkscrews, and after several jaunts around May’s all I ended up with is a couple of long French Champagne taps, and yet another Flash (this one for Hollywood Florida). After exhausting the field, and feeling like another lap wouldn’t net out anything, I hopped in the car and headed for Boston where I picked up the lovely bride! On Day 4, the lovely and I, headed back down to Brimfield for the Friday opening of J & J’s. This particular field is always pretty fun, as many of the dealers that set up there, don’t set up any previous days. So, there is the chance of finding “fresh” merchandise. As we meandered along, we passed on a Ivory corkscrew with sterling as it was a bit pricey, but then the lovely eyed a bar spoon with corkscrew, and oddly enough a few booths later a very different bar spoon with corkscrew. Both good deals at about at 5 bucks each. 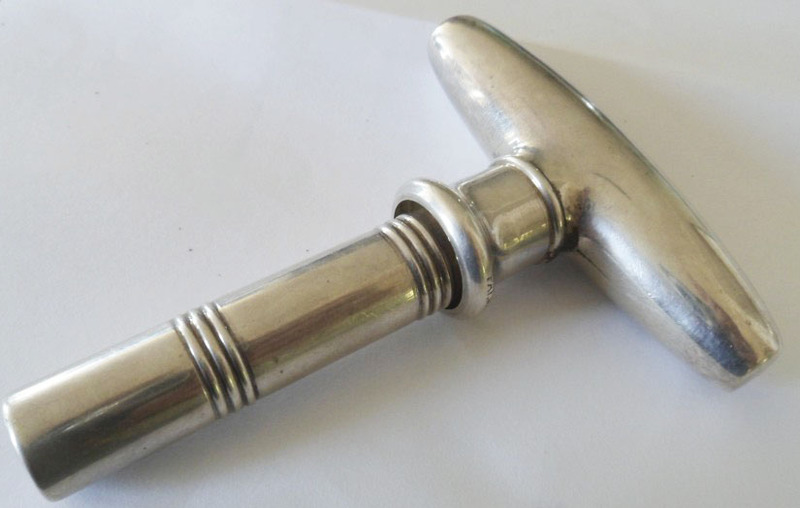 However, in the same booth with the second bar spoon was a handsome stag handle corkscrew with sterling end cap. 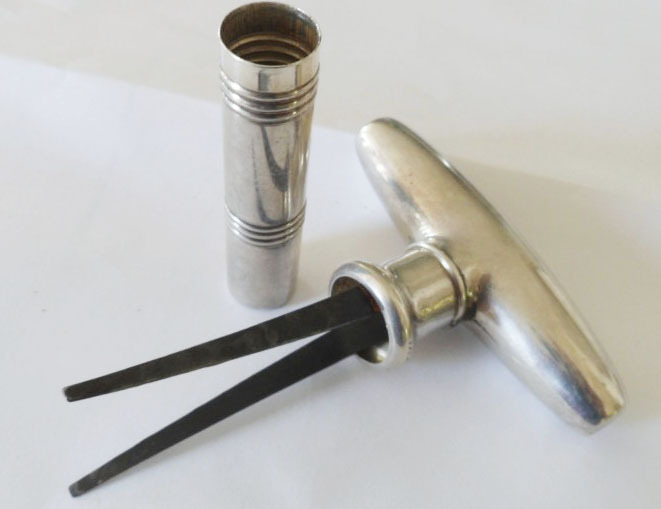 While, I don’t think all the dealers at Brimfield get together and discuss pricing, as a rule, if you happen to run across a nice stag handle corkscrew, or ivory handle, with any sterling adornments you will see prices of 285, 300, 450 and similar. This one however, was significantly less, and more importantly, didn’t have your ordinary sterling end cap. 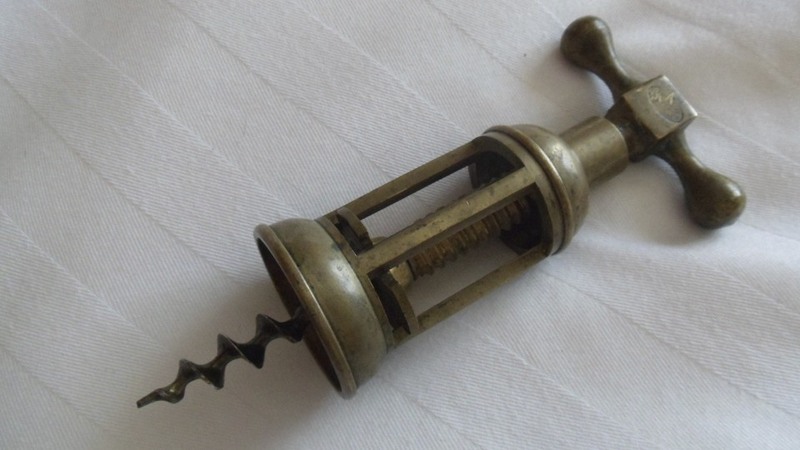 This one instead, looks to be a Theiry and Crosselmire patent corkscrew, and the makers cut away all the existing sterling except for said endcap. An interesting variation of a corkscrew which doesn’t turn up all that often. After examining the corkscrew closely, we agreed upon a price, and off we went. Not many corkscrews after that purchase, but we walked the field a bit longer, and then decided it was time to hit the road. Montague is home to the breeder where our new puppy is coming from, and we spent a few hours with the nine puppies, their mom, and the breeder. At 7 weeks they are playful and goofy. And, the lovely and I decided that the one we had chosen a couple of weeks ago, is indeed the one that will be coming home with us in a couple of weeks. 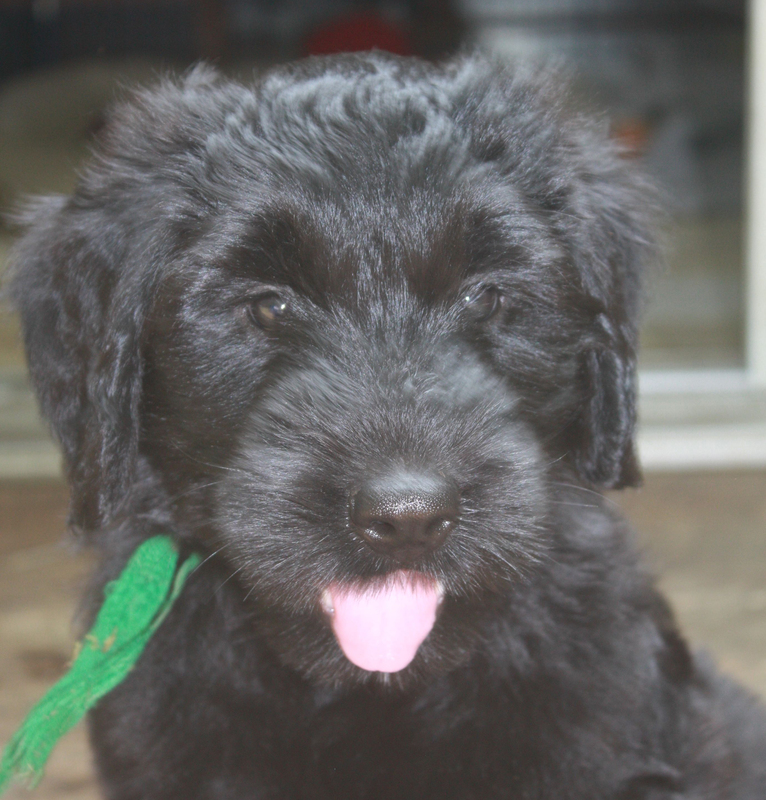 As mentioned in a previous blog, in the Briard world, each year is designated with a letter with which one is supposed to find a name for that year’s puppies. And, this year happens to be an H year. 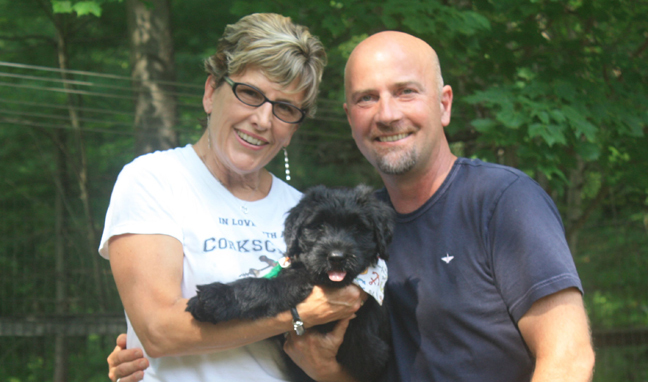 For months we have been discussing possible names, Helix, Henshall, Hanzell, etc… As it happens, the AKC name, doesn’t really have to be the call name, so we wanted to get creative and satisfy the AKC and come up with a corkscrew centric name that would also work. After visiting the pups, we made our way back to the island, where yesterday was a fantastic Summer day. We road bikes around the island in the morning, then hopped into a boat with some friends and headed to another small island for a picnic of lobster rolls and wine/beer, and then in the evening hopped into a small skiff to head over to North Haven for a premiere of a new movie. I will post a few pictures of corkscrews that were acquired over the last couple of days of Brimfield soon, but right now another cup of coffee is in order. So, this morning started a bit later, but still required an early wake up call. And, after the requisite cup(s) of coffee, I was soon heading to Brimfield. I was lined up, and hadn’t seen Barry, so I figured he was on the opposite side of the field, as is his habit. And, when the gates opened, I scurried in with the other attendees. This first particular field, has never really been good to me. And, with the exception of a couple of bottle openers, a few Anri stoppers, I have only bought a couple of items that resembled a corkscrew. At the 9th booth, I did see a corkscrew that might be worth buying. 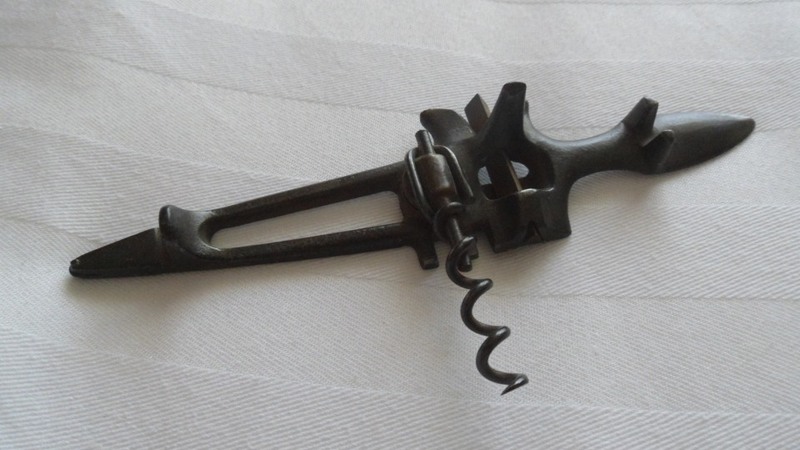 And, after negotiating the price down, I was the proud owner of a Walker corkscrew with knife/blade on the handle. And, as far as corkscrews go, that was pretty much it for that field. 225 dealers, one corkscrew. Not that there weren’t other corkscrews, there were. And, I am pretty sure they are still there, as when I ran into BT later that morning, we discussed what we each had picked up thus far. I showed him the Walker, and he explained that he had found a Flash. With the smaller amount of dealers, it meant scouring the field went a bit quicker than usual, and I found myself meandering around waiting for the next field to open (and the next). And, as the time approached for the next field, BT and AB discussed corkscrews, and prices, and other stuff to kill the time. About an hour after the field opened, I ran into Barry again. Still nothing worth buying, unless you wanted a tusk with sterling corkscrew with half of a helix and a 185 dollar price tag. I’ll pass, thank you just the same. And, the third field was similar. Nothing was there. I mean, other stuff was there. But, no corkscrews. Did we buy all of them yesterday? Still, I enjoyed the conversation, the sunshine, the friendly banter with the dealers, and I did manage to unload some misc. sterling silver stuff to a dealer friend. Oddly enough, I made more money than I spent today. 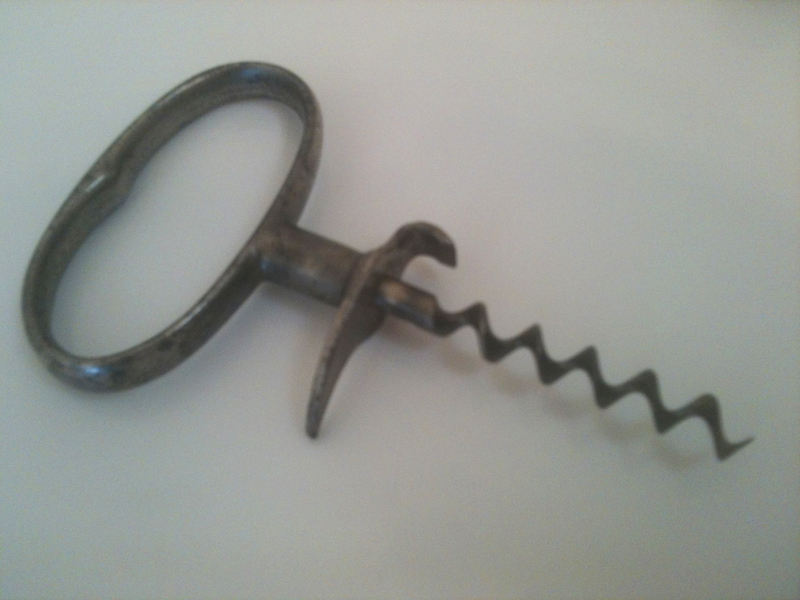 While a nice turn of events, I would rather have spent said dollars on corkscrews–if I could find one! Anyway, the pamphlet did give a little history which will be added to the Frary story. Perhaps a catalog showing all Frary’s wares will turn up eventually. The hunt continues! 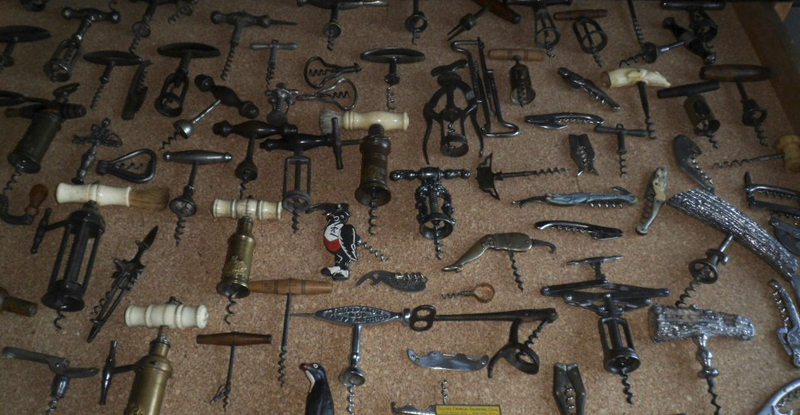 And, perhaps tomorrow at Brimfield, corkscrews again will be unearthed! This morning started with a couple of cups of coffee and a relatively short drive to Brimfield. And, after a brief stop at the ATM, I found myself pulling up a couple cars away from BT who has also just arrived. We met up, and talked a bit on our way to the various dealers. Parting ways, we knew we would run into each other multiple times, and I went about peeking and peering into people’s tents and booths with the aid of a flashlight–it was still dark after all. However, in short order the sun rose, and I meandered the fields, searching for corkscrews and anything else that I might find interesting. After a couple of booths, I managed to find a nice little wooden T pull and a L.F.& C (that is Landers Frary & Clark for those of you keeping score at home) pocket knife with corkscrew. 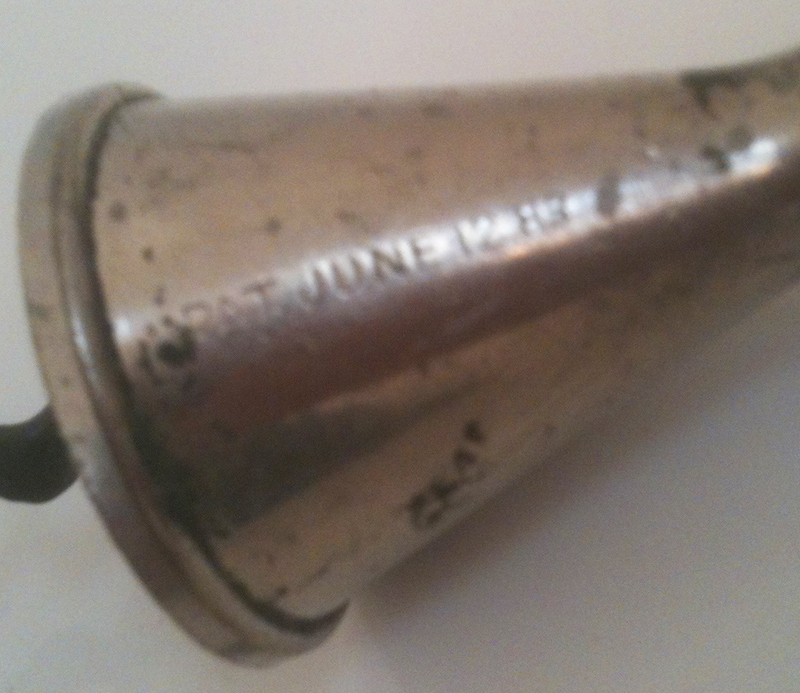 And, in another a Dewars bottle roundlet. I probably would have passed on the roundlet, but I liked the fact that the label/badge is upside down. Still in the same field, I turned a corner and saw a Syroco Waiter with a cheap asking price–after they came down even further, I snapped him up. And, shortly thereafter ran into KC. With pleasantries exchanged, we each headed off in opposite directions. And, along the way, I picked up a couple of Flash corkscrews (Tommy check your list, one is for Taconic Trail and the other Presque Isle Maine), an R. Murphy Boston direct pull, and a couple of Anri mechanical stoppers. With many dealer’s booths having been scoured, I grabbed some coffee and then headed toward another field. Taking a little more time than usual at each booth, as there was a fair amount of time before the first paid admission field was scheduled to open. And, in the far corner of the field, a pretty nice find was made; a nice 6 tool bow. This one is marked Germany, and it is in immaculate shape. Quite pleased with the find, and the cup of coffee, I decided to have another; cup of coffee that is. Yes, I was hoping for another nice corkscrew as well, but I felt the day was shaping up pretty well. And, then… Yes… it does seem to happen this way, I made my way back up to the opposite end of Brimfield and saw a corkscrew that looked familiar. One of those multi-tool glass cutter thingies with the corkscrew attached. However, this one looked slightly different. I asked the dealer to see it, and it indeed was quite different. After unsuccessfully being able to negotiate a price that felt reasonable, I handed the corkscrew back, sipped some coffee, and made my way through the rest of the field. A few minutes later, I ran into BT, and we discussed the corkscrew. I explained that it had a patent date, but I couldn’t remember the patent. I described one particular aspect of the way the helix was attached, and he knew the exact piece. While the name of the patentee escaped him, we discussed the rarity/scarcity of the piece, and I suggested that since we had time to kill, we head up there and see if it was still available. As luck would have it, the piece was still available, and after a little negotiating, which didn’t help as the price was the same, I paid for the corkscrew and put it in my backpack. There were a couple remaining fields to search, and during said searching, I managed to pick up a nice Edwin Jay signed four pillar brass Italian corkscrew for cheap. And, with all the day’s fields sufficiently scoured, I headed back to the hotel. Upon my return to the hotel, I did some research via google patents, as the corkscrew has the patent date PAT APR 28, 1874 on the reverse side. 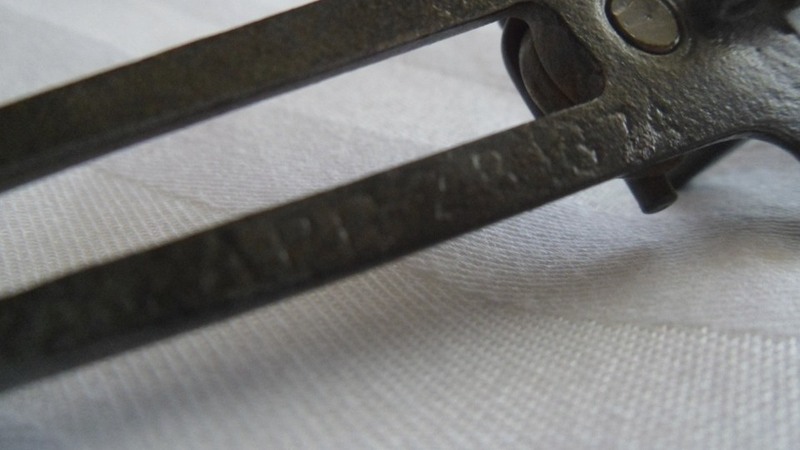 Nothing that stood out as a corkscrew, but a name sounded familiar–and given the patent was for an Improvement in Knife-Sharpeners–I was pretty convinced. And, as luck would have it, I found another example that sold online 5 years ago that had H.P Brooks name imprinted next to the patent date, which confirmed the patent. 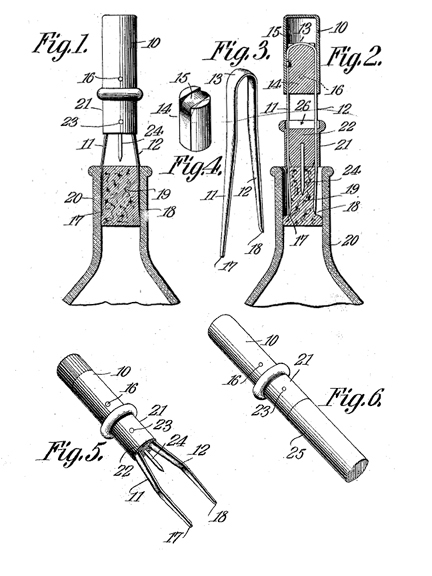 So, it looks like we have added an 1874 Heman Brooks patent to the collection. 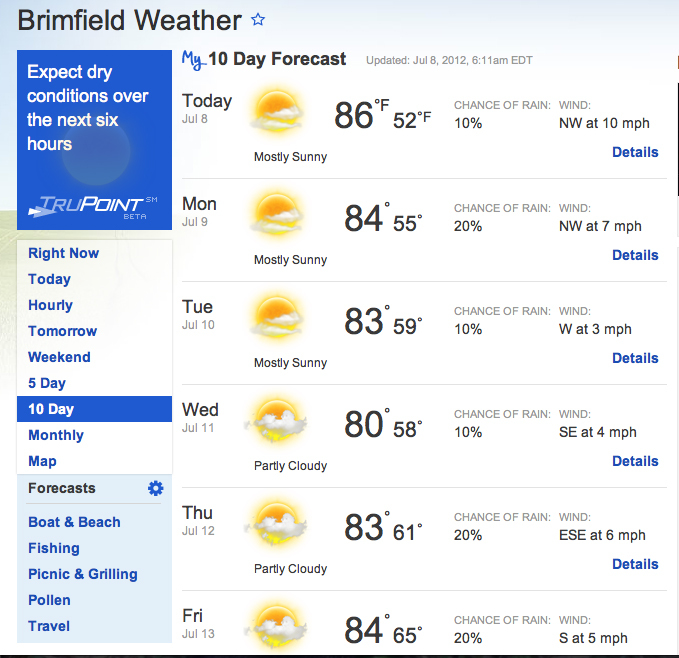 I am in the process of packing for Brimfield, and decided to check the weather to see what is in the forecast. Historically, the July show is hot, humid, with at least one thunderstorm–usually on Thursday. However, according to weather.com, it looks like it is going to be low to mid 80’s degrees each day, with no rain (or thunder and lightening) for the next week! Hopefully, the nice temperatures will make for a little less grumpy antique dealers. In May, the dealers seem optimistic, but in the July heat, that optimism turns to complaints about the temperature, the lack of customers, the impending storms, the heat, the humidity, and the lack of customers. And, of course, the heat. I will update the blog with any finds at the July show. 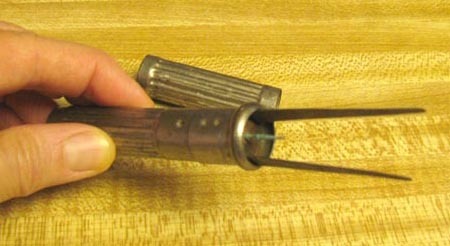 There have been some disappointing July shows, as those of us hunting for corkscrews come up empty, or close to empty. Still, there have been some awesome finds at the July show as well; five dollar Singleton bow, Monfort patent champagne tap, Hicks and Reynolds, etc. It is only a few days until Brimfield, and the mind races. What will turn up? Who will discover what? 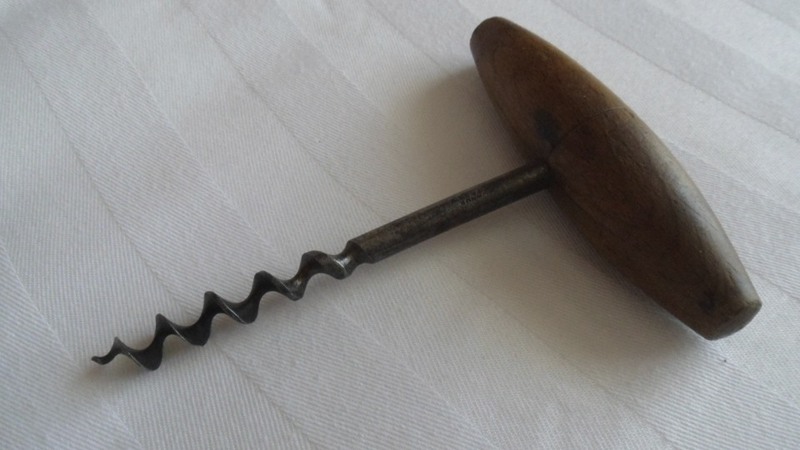 Will there be a rare corkscrew unearthed? This time around, instead of going to the first few days of Brimfield, I will be staying there for a couple extra, and the lovely bride will be joining me! 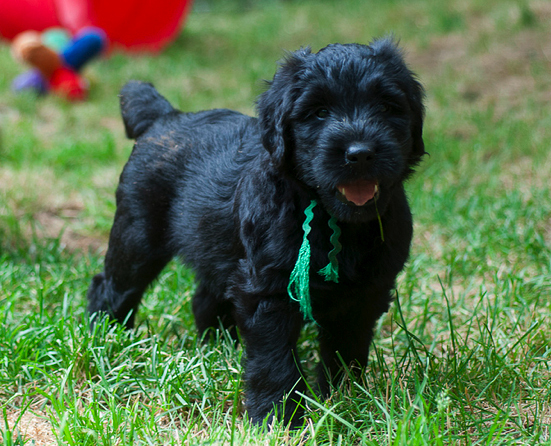 And, after Brimfield on Friday, we will be heading to see the puppies. They will be closing in on 7 weeks at that point, and soon enough one will be coming home with us.